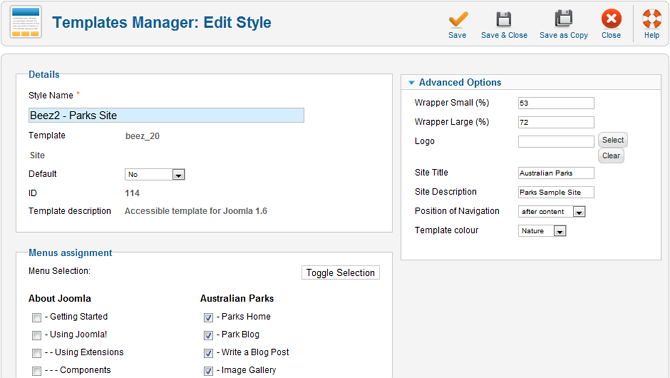 This screen is accessed from the back-end Joomla! administrator panel. It is used to edit template styles. Navigate to the Template Manager: Styles screen. To edit a template style, click on the style's name or check the style's checkbox and press the Edit icon in the toolbar. This is where you edit template styles. When a template is first installed, a default style is created for it. The default style for the template will have the same name as the template with a - Default suffix. To make a different variation of the default template style, check the default style's checkbox and press the Duplicate icon in the toolbar. Then edit the duplicate. Style Name. The name of the style. This is the name that will display in the Style column of the Template Manager: Styles screen. Template. The name of the template the style is derived from. Default. Whether or not the style is the default for the location. Template description. The description of the template the style is derived from. This section contains all the menu items configured in your Joomla! website. To apply the current style to a menu item's corresponding web page, check the box next to the menu item. You can press the Toggle Selection button to invert the menu item selections. This section may not be present for all styles. If a template from which a style is derived from has configurable options they will be present here. It is these additional configurable options which allow you to have multiple different styles of templates with variations of these options. The options available will vary based on what options the template developer made available. Save. Saves the item and stays in the edit screen. Save as Copy. Saves this item under a new name, keeping the original item unmodified. This button is available only when editing an existing item, not when creating a new one. Close. Returns to the previous screen without saving your work. If you press Close while adding a new item, this new item will not be created. If you were modifying an existing item, the modifications will not be saved.